The thought of working in an office, tucked away behind a desk makes you break out in hives. Well, you know all those wires at tree lines and buried in ditches next to the streets? Those are installed and maintained by linemen. If working in the outdoors, doing electrical work is something that sparks your interest, then learn more about what it takes to become a lineman. You’ll install, maintain, and repair lines to keep power uninterrupted (hopefully). You’ll find and repair any defective devices or any other issues that would prevent power. You’ll string the wires along the poles. You’ll climb the poles and towers, or work from a bucket on a truck to complete your job. You’ll know how to work all the equipment associated with your job. You may do some minor traveling throughout your work day. You’ll be knowledgeable in work safety best practices. Put cables underground, including fiber optics. Place aerial cables across bodies of water. Pull the cables from underground. Your job will require you to have strength and stamina to perform it optimally. You will find yourself in strange positions, sometimes for prolonged periods. You’ll also be expected to work in rain, snow, sleet, hail, wind, and other weather-related conditions. Your color vision needs to be excellent: You’ll need to be able to determine the colors of wires, otherwise there could be devastating consequences. 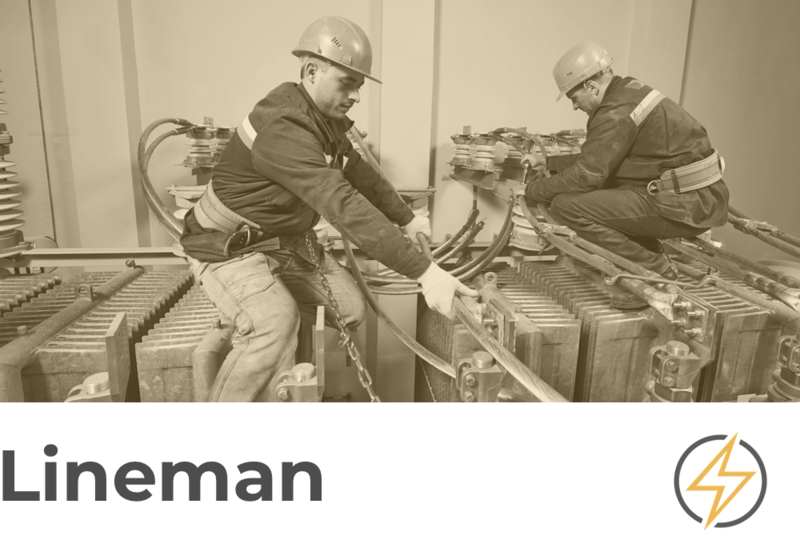 If you think you’re up to the task, then read on about how to become a lineman. Have a high school diploma or GED (employers really prefer their hires to have this). Complete at least one year of algebra. Pass with a qualifying grade on an aptitude test. Pass a substance abuse panel screening. Decide if you’re going to do an apprenticeship, attend community college for telecommunications, electronics, or electricity, or be trained by an employer. Apprenticeship and training programs last three years. Community colleges can be completed in two years if you go full time. Once you’ve completed your training or college program, consider getting more certifications. If you drive certain types of trucks for your job, you may have to get your commercial driver’s license (CDL). You’ll become a journey lineman after three to four years, which means you’re no longer an apprentice but a full-on lineman who can work independently. After a few more years, you can become a supervisor or trainer. Experience through military training is also an acceptable path toward becoming a lineman. The work you’ll do has the potential to be dangerous, so it’s important to follow all the safety protocol you’ll learn. Depending on your employer, there may be a continuing education component to your job. As a lineman, you can expect to work irregular and weekend hours. If there’s a storm and power goes out, then you’re called into action to restore that power. If you’re a lineman working as a power line installer and repairer, expect a median annual salary of close to $69K, with entry level at $38K. With a few years under your sleeve, salaries move close to $100K. If you work in the telecommunications industry as a line installer and repairer, your median annual salary is $55K, with entry level at $29K. Once you’ve been working for a few years, you’ll start earning closer to $85K. Salaries vary depending on experience, industry, and where you work. Through 2026, there will be 18,500 new jobs opening between outdoor linemen and telecommunications linemen. Opportunities will be great if you have either a two-year degree or apprenticeship training.